​Where are you from? Your profession? I am from Utah and have lived there most my life. I am a Licensed Clinical Social Worker and retired from the mental health field in 2012. When and how did you become interested in paddling? I must admit I am not a very experienced paddler, having spent most of my outdoor energy in the deserts of Utah and the Wind River Mountains in Wyoming. But my camping friend Paul Westberry contacted me in late summer of 2008 and said I should join him for a paddle on the Suwanee River in November. November in Utah is generally pretty cold with inversions that cause bad air, so I figured I would head out to sunny Florida and enjoy a leisurely paddle down the exotic river of Stephan Foster fame. The first night at Stephan Foster State Park the temperature went down to freezing. Surprise to me. All was well the next morning when we headed out on the misty, chilly, mysterious river. It was great and I was hooked. Where is your favorite place to paddle? I tend to enjoy the rivers more than the ocean--I suppose due to the mysteries of seeing what’s around the next bend. But I have loved every minute of all my travels with Paddle Florida (except maybe that time on the Keys trip with forty mph headwind, driving rain, paddling against an outgoing tide with only a mile to go to camp that took an hour). I suppose I enjoy the Suwanee trips the best of all. I have done a couple with different beginnings and enjoy seeing new territory. It is all a wonderful adventure for a boy from Utah. I just love the misty morning take-offs with the moody black water, birds, wildlife, and Spanish moss dangling from trees. Very different from the high deserts out west. What’s the most interesting thing that ever happened to you on a paddling trip? All the trips I have been on have been exciting adventures, but the most startling perhaps was hearing an eerie noise up ahead on the Peace River. On paddling 'round the bend, I saw a big old dog with a feral hog by the ear in the river. Squealing and huffing and struggling and water flying and WOW--that's just something you don't see every day! That dog was locked on and was not about to let go. The hog was not going to submit. So it went on and on until I was downriver and out of sight. We did see the cowboy on the bank later on and let him know that his dog was upstream and perhaps had bitten off more than he could chew. How many Paddle Florida trips have you gone on and to where? Paul Westberry has roped me into coming down to Florida almost every year for a paddle trip for many years now. It is hard tearing myself away from snow shoveling and freezing temps in Utah, but because Paul is a generous and tolerant man, he has encouraged (and provided equipment) for me to paddle the Peace River at least three times, Suwannee at least twice, and the Keys Challenge twice. 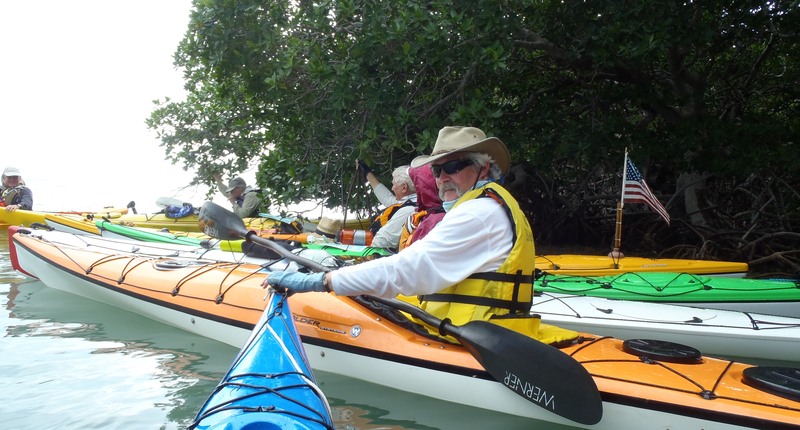 The latest trip was the Great Calusa Blueway last February. I am a lucky man. Can you describe a Paddle Florida trip highlight? I cannot even begin to pick out highlights from my Paddle Florida trips. When I get there and all I have to do is eat, load my grip on the truck, paddle down that lazy river, pull my kayak out on the bank at the end of the day after a lovely (usually warm and scenic) day, sit in my camp chair to rest up and then eat again, well it is just too difficult to pick highlights. It's all highlights. And the programs in the evening--they are great. Quality entertainment and/or interesting science and local knowledge every night, hanging out with smart people--where else can you get all this in one go? Cruise ship I suppose, but they don't travel on the Suwannee or let you paddle at your own speed, and they may not have the concentration of smart people. Did I mention the food? Great food from local folks. I have never gone to bed hungry. What advice do you have for folks considering a Paddle Florida trip? If I had never gone on a trip with Paddle Florida and was considering it, and didn't know Paul Westberry, I would call Jill and talk with her or any of the folks associated with Paddle Florida. They will help you out with what equipment you need and stuff to bring and such. They'll make sure you have a great trip. This is a great organization.